Battle is defined as a fight, struggle, contest or conflict, between two or more contending/opposing forces or groups. And like different armies engaged in battlefield, a whole lot of categorized sacrifices are involved which among other things, include physical, spiritual and psychological investments. This is geared towards attaining eventual victory over another based on tactical combat prowess. To also make it in life, there exist series of battles to fight to achieve set objectives. Beyond the battles that involve armies or group of people aligned to engage opposing enemies, are also INTERNAL AND EXTERNAL BATTLES. Internal battle comprises of personal and interpersonal fights within a given localities or areas. While personal battle can be exclusively mental, interpersonal battle involves two or more persons within a given location which centres primarily on issues bordering on ownership of properties, perception on issues and ideologies. In external battle or conflict, group of people from different locality, race or nationality get involved with their opponent over claims of interests and a good example of this, is the deadly war of attrition Nigeria allied forces waged against Biafrans between 1967-1970. However, it is important to clearly state here that the main reason that triggers off INTERNAL (interpersonal) and external conflicts rests principally on unresolved disputes. These when allowed to linger, give birth to devastating wars and that is why it becomes necessary that prompt conflict resolution tips be not only recommended but effectively enforced to stem any unpleasant consequences amongst the people. Such unhealthy contests or battles come with them, colossal measures of disadvantages to the opposing contenders. There must certainly be losses of men or materials. And that is why one Biafran (Igbo) adage which says that: "the song you sing while going into battle, never remains same while getting back home", comes in handy. There certainly must be a twist either for or against. Both opponents involved surely, will count their costs at the end of it all. In the Biafra restoration struggle which commenced in the era of Chukwuemeka Odimegwu Ojukwu, it actually tended to carve a permanent nitch for Biafrans if it had succeeded. There was a massive alignment of enemy forces garnered for Nigeria by the British government against Biafrans which resulted in three (3) years gruesome war (1967-1970), that claimed over 3 million Biafrans including women and children. History has it that the very main reason that led to the lost of that battle was not because the enemies had superior tactical approach to the battle but because of the saboteurs within who sold out to the enemy (Nigeria) due to egocentric interests. They shamelessly sold the overriding interests of their own people to the enemy. That brought about the claimed defeat of the Biafran forces in that war. Presently, comes the re-emergence of the Biafran restoration struggle which is being championed by Mazi Nnamdi Kanu, the founder and leader of the Indigenous People of Biafra (IPOB) worldwide. Through the dogged and more enlightened leadership style of the IPOB leader, the restoration project has been repositioned and reinvigorated with the focus and attention of the International community interestingly, fully directed at the activities of this unique mass movement. 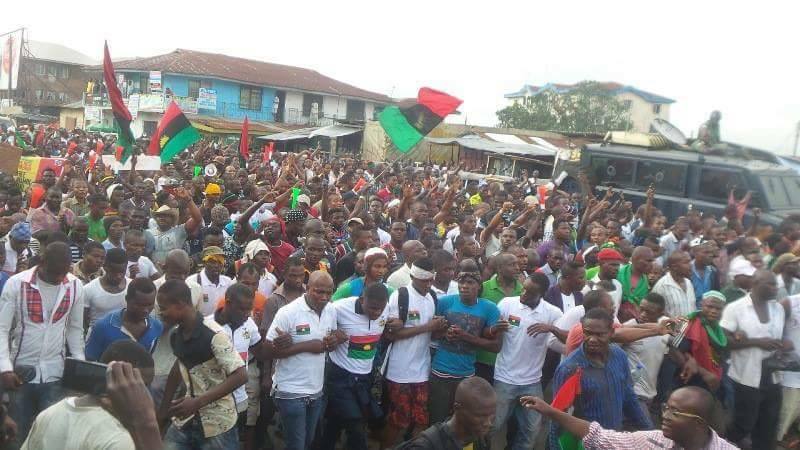 It is however disheartening to note that even among this crop of Biafrans all over the world, there arose and are yet arising, groups of hoodlums and saboteurs of Biafran extraction, who have sold their souls to the devil in their crave to scuttle the gains so far recorded in the Biafra restoration effort. They threw patriotism, freedom and justice for their people into the winds and connived with their Nigerian slavemasters for perishable selfish peanuts. But we remain grateful to God Almighty who never allow their evil deeds to prosper. We appreciate Him for the supreme leader of the Indigenous People of Biafra (IPOB), Mazi Nnamdi Kanu and members of the organization's leadership through whose wisdom, the aspirations of Biafrans are yet kept afloat. These internal enemies are not relenting in their bizarre bid of poisoning the minds of the uninformed and the misinformed amongst us but the resilience and dexterity of the teaming number of the enlightened, have remained the encouraging and indispensable factors of our victory. The domestic (internal) enemies, disguise as being part of us while sinisterly working for their slavemasters, but their evil antics are steadily being exposed and defeated. The efforts employed towards the full and total restoration of the sovereign nation of Biafra can never be compromised. These enemies must most assuredly, be defeated. The lessons of the events of the 1967-1970 war between Biafra and Nigeria have been learnt and must never be repeated. The Nigeria contraption ostensibly effected by Fredrick Lugard in 1914 to service the interests of the British, expired in 2014 after 100 years of fruitless experiment. The Abuja based Biafran politicians who are today licking the boots of the Sokoto caliphate and are beneficiaries of this misnomer with the insane connivance of the "OHANEZE NDIGBO" Social-cultural group would not want a departure from the status quo because of personal gains. They from their body languages, have vowed to truncate the restoration struggle as driven by Mazi Nnamdi Kanu and the Indigenous People of Biafra (IPOB). In a recent media report, Chief John Nnia Nwodo - the compromised leader of "OHANEZE NDIGBO" Social-cultural group, in a conference held in Lagos, was credited to have shamelessly denounced the credible work the IPOB is relentlessly doing for the freedom and respect of Biafrans. These are supposedly men of honour who were meant to represent and fight for the interests of their own people. They have wittingly, constituted themselves as internal enemies ably aiding the external oppressors against their people whose interests they have mortgaged for frivolities. These are men that have sold their consciences to Lucifer. But we must have to encourage ourselves, stand our ground and engage them in this battle for the total emancipation of our people and the upcoming generations. They must not be allowed to win this battle. So many Biafrans have sacrificed even their lives and comforts in this restoration quest, following the oppressive activities of our external enemies, and these enemies are willing and ready to unleash more of their venoms on us if allowed unchecked. We must therefore as Biafrans and members of the Indigenous People of Biafra (IPOB) under the leadership of Mazi Nnamdi Kanu, in unison with lovers of freedom all over the world, arise and vehemently stand opposed to the antics of these enemies. We must never relevant nor mutate. Biafra restoration project is a task that must be not compromised!